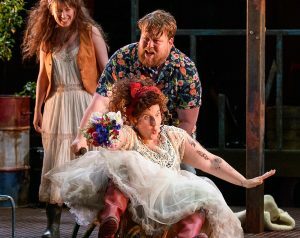 Shakespeare’s slight and silly comedy, As You Like It, is just the thing for midsummer. 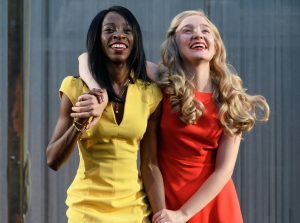 While England were crashing out of the World Cup, London’s Regent’s Park Open Air Theatre launched its latest production, a playful and thoroughly enjoyable romcom, that ticked all the right boxes. We may think that global concern about pollution is a first world, 21st century, problem, but Shakespeare, too, dreamed of a Utopian idyll, away from fetid city streets and possibly back to his rural, Warwickshire, home. Max Webster’s modern dress version opens in a royal court, ruled by Duke Frederick, an unlikable rogue, where the scenery and TV broadcasts leave us in no doubt that the selfishness of humanity is destroying the planet. It’s a gloomy dystopian prophecy, complete with almost constant rain, no doubt caused by climate change (ironic considering the drought we are currently enduring). While the Open Air Theatre nestles in its own idyllic surroundings, with ring-necked parakeets squawking a tune and flying overhead, and the air scented with honeysuckle and roses, the stage is awash with rubbish. And, in the opening scenes we see courtiers carelessly discard their coffee cups, crisp packets float in a stream and litter carelessly collected by a pair of indolent men. But one of the men has more reason to gripe and resent his situation. Orlando should be a gentlemen but was robbed of the position by his older brother. While decrying his lot he sees the lovely Rosalind out walking with her cousin, the duke’s daughter, Celia. It is love at first sight for Orlando and Rosalind, daughter of usurped rightful ruler, Duke Senior, but the pair are soon wrenched apart. Orlando must flee after getting on the wrong side of his brother, Oliver, and Rosalind is told to leave, on pain of death, by an angry Frederick. Rosalind decides the safest course of action is to assume the identity of a man and, accompanied by Celia, head to the Forest of Arden where her father now lives blissfully in the woods. It’s here that audiences must suspend disbelief. In the eco-friendly Arden we find Duke Senior (both roles are played by Simon Armstrong) with a crown replaced by a stetson and royal vestments now a fetching Drizabone waxed stockman’s coat and obligatory check shirt and jeans. He and his followers live as one with nature, in rough hewn wooden huts (complete with solar panels), and enjoy campfire songs and plentiful food. And, while this is a comedy, it is also surprisingly lyrical. Webster has played a blinder by getting former Noah and the Whale frontman Charlie Fink to write some original tunes and they’re toe-tapping catchy. Now, logically, you’d have thought that on arrival at this Garden of Eden Rosalind – now called Ganymede – would have thrown off her disguise and put her arms around her long-banished dad for a cuddle – but no. Then Orlando turns up and starts writing love letters to her, which he posts on trees around this rustic paradise, and mooning about like a lovesick pup, desperate for his lost girlfriend. But does she revert to being Rosalind and living happily ever after? No again. And, in point of fact, if she had, it would be a pretty short play. Shakespeare keeps us in suspense by coming up with a highly convoluted plot which prevents true love taking the most direct course and, instead, launching it wildly off track for another two hours. What’s more there’s obviously something in the air that makes love almost infectious in Arden. 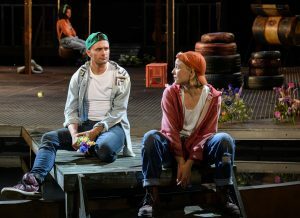 While Ganymede is playing hard to get with Orlando, her servant, Touchstone (Danny Kirrane, determinedly attempting to steal the show with a hilarious, pitch-perfect, turn as the fool) pursues a goatherd called Audrey. Lower down the ranks, shepherd Silvius, fails miserably to woo shepherdess Phoebe (Jacade Simpson earning the sympathy of the audience for his efforts) because she has fallen for Ganymede. With a preposterous, left-field, ending that bookends the unlikely beginning, the interim offers riotously funny comedy and some endearing performances. Olivia Vinall, as Rosalind, doesn’t take her transformation to deep voiced boy too seriously and she turns out to be quite Puckish in her ability to create magic out of mayhem. Edward Hogg makes a fine romantic hero despite being fooled by Ganymede’s non-existent disguise and contrived courtship. While lovers woo poor Maureen Beattie’s melancholic lord, Jacques, must wander around the Arden stronghold with a permanently dour expression – although she does get the play’s finest speeches which are delivered earnestly and with full solemnity. Inexplicably, according to the programme notes, Jacques is the older brother of Orlando yet neither seem to recognise each other. 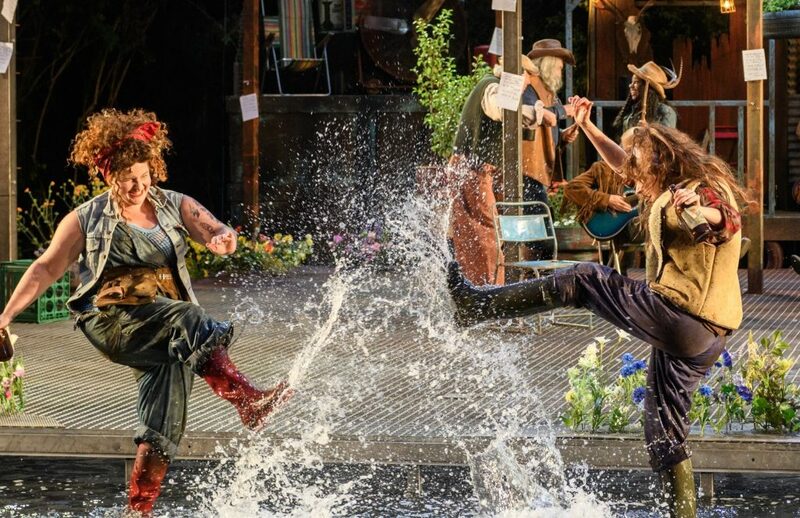 As You Like It is idyllic whimsy with a touch of delighful midsummer madness. Running until July 28.
Review. 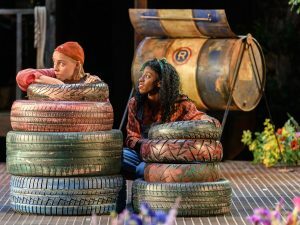 Max Webster delivers a delightfully funny romcom with a modern dress As You Like It that includes an on-trend eco-nod about climate change and plastic pollution.